Monetary tithing has been taught as an undisputed fact in churches for centuries. Kleptomaniac: Who’s Really Robbing God Anyway challenges that assumption and puts modern tithe teachings to the microscope of scripture. This book examines the word tithe from the original Hebrew language and presents the authentic meaning of the the orthodox term based on the land, language and literature of the Hebrew people. The message of the book is that ten percent of a person’s income does not represent a biblical tithe. The biblical tithe has always been food. A monetary tithe of ten percent represents a tax for religious purposes. A true biblical tithe is narrowly limited to food and clean animals from inside the land of Israel. Also, true biblical tithing was never extended to crafts or trades, and since Jesus was never a farmer, nor headsman, he was not required to tithe. 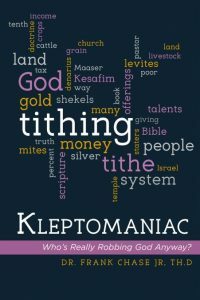 Kleptomaniac: Who’s Really Robbing God Anyway is an educational book that tackles a religious taboo subject such as tithing and presents more information about an under-saturated subject in the book world concerning tithing. The book is a scholastic, theological work and should be read by anyone who has skepticism about the truth and accuracy of the modern monetary tithe system that is not contained on the pages of the Bible. This Non-Fiction book is available in ebook and print formats.